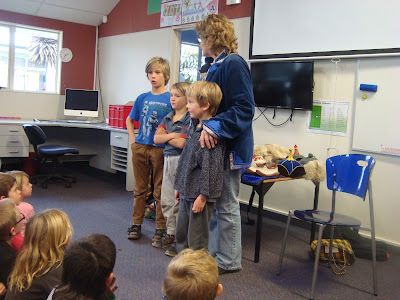 This week we were treated to a talk from Dylan, Hunter and Zeb's grandma (Sue). Sue told us all about life in Mongolia and Africa. She had lived in both these countries for many years. In Mongolia it gets very cold, actually it can be minus 40degrees!! So when you live there you need to wear lots of layers of clothing. Sue brought in some examples of the clothes they wear. In the part of Africa where Sue was it is the exact opposite, very hot, in fact 40degrees!! What an interesting life you have had Sue. Thankyou for sharing your experiences with us. 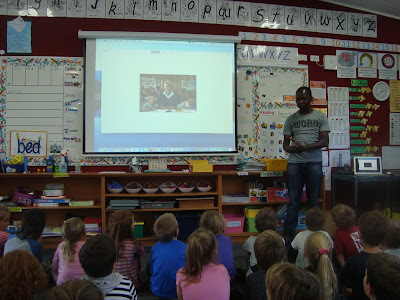 We also had a visit from Paul. Paul lived in Kenya when he was a young boy. Wow, life couldn't get much different from our own at Hope School. Paul told us that to get to school he had to walk or run a distance similar to that from Hope School to Tahunanui and to get water he and his family had to walk with the empty containers as far as into Richmond and of course back again with the full containers. There would have been about 50 kids in his class and one teacher. They used to make balls out of plastic bags so they had something to play with. Their houses would have a grass roof so if it rained (and it did a lot sometimes) They would have lots of buckets to catch the water that fell inside. It was also very hot in Kenya. Thanks Paul, what a privilege it has been listening to you.